CDL course now or later? I will do the Mom thing here and say...The time you miss while your children are growing up is time you will never get back, and time you will forever regret missing. Your son is at an age where the most important thing he needs is a male roll model.. And if you are fortunate enough to be able to be that roll model, don't pass up this most important job as a father. If it puts your truck driving adventure back a few years...look at it this way...When you son is 16-17, and has grown to love and respect his dad, What a great way to share some quality time by traveling the US highways for a summer in a big truck ?? I took my granddaughter on a couple of summer adventures in our truck. It was memory making at its finest. Now I'd also taken her with me when she was 4...It was........interesting......But when she turned 17, and we headed out for a full summer it was magical. We formed a bound that will never change with time of changes in our lives. So even if it puts your dreams on hold, think about what dreams you can share later on. Thanks Starcar, It's good to hear what "Mom" would say in this case, and she'd be right! I guess I just needed to hear it. Fact is I'm divorced and my son and his grandmother lives with me. My son's mother chose to live 3 hours away. All the more reason why I need to stay with him. So yeah, I guess my big truck driving dreams will have to wait, at least for a while. In the meantime I'm gonna keep driving the bus and limo's till the time is right. Thanks Brett....I totally understand the pre-hire letter now! Well I can assure you the trucking industry will be there for ya whenever you're ready. If you're not ready for it yet because other priorities are in your life, don't sweat it. You want to make sure the time is right. Not sure when the right time will be but in the meantime I want to continue to drive professionally; however, my experience is school buses and limos. So I'm going to see what I can drive locally untill I take the plunge and go to truck driving school. Perhaps a box truck or garbage truck (heck it's better than going back to the office job). You definitely don't want to get the class A and sit on it for a while. Companies want you to have completed your schooling within a short time of getting hired - usually anywhere from 30-90 days. Otherwise you'll have to take a refresher course or possibly do the schooling over again before they'll hire you on. So don't get the license until you're ready to actually do it. Yeah, I guess I kinda saw that (heard that) coming. But now that I got the bug to drive for a living, I want and need something more solid than driving a school bus and limo---which I've been doing for the past year. 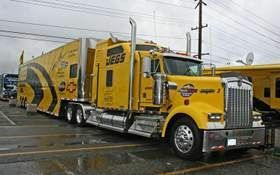 Ultimately I'd like to drive the big rig cuz i don't want to regret not giving it a try. Ok so my big question I'm asking myself is should I register now or later for truck driving school? Why do I ask? Ok, for 12 months now I've been pondering this career possibility as a truck driver. Also read Brett's book, "The Raw Truth About Truck Driving" and I'm convinced I'd enjoy the truck driving lifestyle. However, I have a 12 year old son that is making me think twice about being out on the road for days/weeks at a time. It's not the first 6 or 9 months of OTR training that concerns me---I can deal with that but then I'd want to find a local gig afterward, at least until my son is older like in high school. Also, I have the resources to take the truck driving class now so that's not an issue. In fact I wouldn't mind getting my class A now even if I sit on it for a while. Good problems to have I guess. Your thoughts? Ok, perhaps this is a dumb question but why do you need pre-hire letters to go to CDL school? But seriously, I understand the intent of the pre-hire letter and I plan to obtain as many as I could get! Thanks. Ok, I get that. But if you have a decent work history, no major issues with your driving record and you have both arms and legs, then why wouldn't ya be at least a candidate in the eyes of a trucking company? I mean I went to college and spent a ton a money but I didn't get pre-hire letters before settling into my dorm room. Will One Stupid Night In 2001 Cost me a Shot at This? Well there is one more more thing that may be a deal breaker on this Trucking deal. I had 1 DUI in 2001 coming home from the studio to change the bandage on a stallion's hurt leg. It had to be changed daily and my wife was out of town. No one cares about the excuses, I know and in Tennessee it appears to be a life sentence on your record, although I have not gone down to verify this as fact. By god, if you have have a brain that will wake you up to how serious law enforcement takes DUI. They put you through hell, believe me. That's all it took, I've had one speeding ticket since. I guess all I can do is get my record from the state and just be up front with every Company I approach for pre-approval. AJ: I know what it's like to have a 12 year old dui and want to get into the trucking business. It sure does appear to be a life sentence when you're looking for a job especially one that involves driving. I recently had an interview with a lady who asked if I had any dui's in my life. After I said yeah, just the one, she got real quiet. Boy I could almost hear her put my resume down before she said ok we'll be in touch. Regardless of that crap, I most agree with your last comment...just be up front with every company. I know I will and I will continue with my ambition to become a truck driver and with a company that will "forgive" my 12 year old piece of stupidity. I've been assured that most companies have a 5 to 10 year no dui policy, so odds are good for us dude.